Bank-attached bar that comprises an array of smaller-scale geomorphic units. Generally composed of laterally accreted sand or gravel, but may include silt or boulders. Variable morphology reflects material texture, flow energy and the history of flood events that form and rework the bar. If a bar is reworked by chute channels, ramps or dissection features may result. Deposition may form ridges and lobes. If vegetation colonises parts of the bar, additional depositional features result. Forms of bank-attached compound bar include compound point bars and compound lateral bars. Development of compound lateral or point bar forms is dependent on channel alignment (and associated implications for the distribution of flow energy over the bar surface at different flow stages) and associated patterns of reworking by flood events. Formed initially from the lag deposition of coarser sediments (a unit bar). At high flow stage the bar may be reworked or material deposited around obstructions. 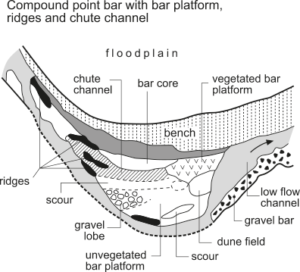 At low flow stage, the bar may have finer depositional features deposited on top of the bar platform, or a range of bedforms preserved, reflecting sediment transport across the bar surface.